Shareholder David Ezra and Attorneys Erin Mindoro and Heather Whitmore co-authored a new article in O.C. Lawyer, a publication by the Orange County Bar Association, on a recent trend in employment litigation trial practice — aggressive use of business judgment and mixed motive jury instructions that may tilt the trial court “playing field” to the point that it is no longer level. 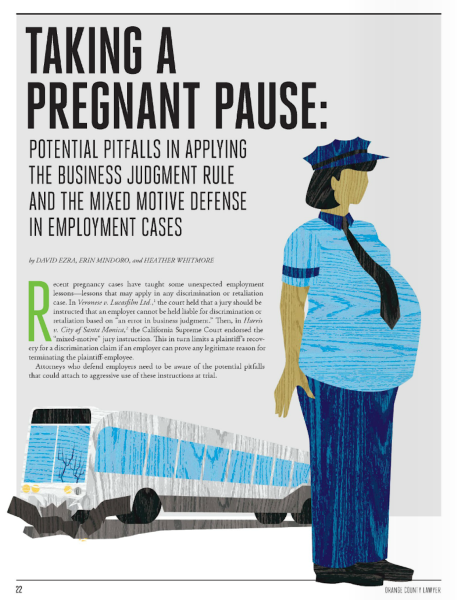 They ask: Are defense attorneys inviting additional appellate scrutiny when they use pregnancy discrimination cases such as Harris v. City of Santa Monica, 56 Cal. 4th 203 (2013) or Veronese v. Lucasfilm Ltd., 212 Cal. App. 4th 1 (2012) to urge courts to instruct juries that employer decisions cannot be second guessed? Will appellate courts accept the idea that a mixed motive limitation on remedies can glibly be applied as a complete defense in non-FEHA cases?